The P8-16 is a companion product for our PROTO-8 PC/104 prototyping breadboard. The adapter upgrades an 8-bit PROTO-8 to full 16-bit capability. This allows users to rapidly evaluate and develop more advanced PC/104 designs. The P8-16 simply plugs into the optional* J2/P2 connector of the PROTO-8. All J2/P2 bus signals are routed directly to a socket strip which accepts 20-28AWG solid wire or component leads. Each signal is clearly identified, making breadboarding quick and straightforward. The original functionality of the PROTO-8 is maintained while at the same time providing a clear path to higher performance 16-bit development. The P8-16 may be freely removed and re-installed as the user alternates between 8 and 16-bit projects. NOTE: The J2/P2 connector is required and must be installed if not already present on the PROTO-8. The standard PROTO-8 is not supplied with this connector which must be purchased separately, stock number 104-00012. Solderless connections are made through a 20 position socket strip. Accepts 20-28AWG solid wire and component leads. All J2/P2 signal designations are clearly printed on the circuit board. 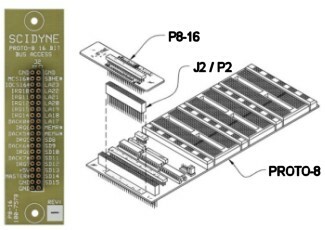 The maximum height of the P8-16 is 0.950" above the PROTO-8 PCB when fully inserted into the J2/P2 connector not including any inserted components or wires.